You started your business, and you know what works best for your staff, your children and your setting. So why do you need a business plan? Writing business plan enables you to focus and review every aspect of your business at once. You can assess parts of your business and make connections that may not have been obvious before. Most importantly you can plan for the future. The sector is understandably worried as new government legislation and underfunding threaten the sustainability of many settings. A business plan can help to make sure your business is stable, and create a basis for future growth. 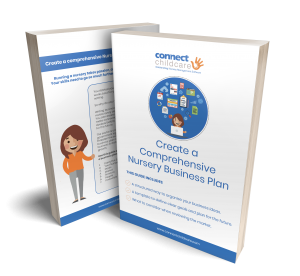 Use this guide as a template to help you write a business plan for your nursery. A structured way to organise your business ideas. A template to define clear goals and plan for the future. What to consider when reviewing the market.